On Wednesday, I did a run/walk for 2 miles. I did a 15 minute walk to warm up, then did 16 x 1 x 1 (16 reps, 1 minute run with 1 minute walk), then I did a 15 minute walk to cool down. Thursday was a rest day. Oh how good those days feel. I know that I need to rest instead of pushing myself so that I don’t injure myself. Sp rest I did. Friday I did a run/walk for 3 miles. I warmed up for 15 minutes with a walk, then did 24 x 1 x 1 (24 reps, 1 minute run with 1 minute walk), then I did a 15 minute walk as a cool down. Saturday was a walk day. So I walked for 2 miles. Nothing hard, just a nice solid walk. Sunday was another rest day. It’s nice to spend those days with the family so that don’t feel so guilty about my training anymore. More rest, and hopefully less injuries. Now for my favorite subject … Shoes!! One of the things that runners have is a lot of shoes. I can look around my office and I see pair after pair of shoes. All kinds … I have Asics, New Balance, Brooks, Mizuno, Hoka’s … and my new favorite running shoe Altra! You might be asking me why Altra? Well, I really like the spacious toe box. My toes splay out, and I have never felt more comfortable in a shoe. And since the surgery, these shoes have given me the room that I needed so that I could heal. It was like walking barefoot, but with shoes on. My toes weren’t cramped, and they are finally starting to look normal. Ok … As normal as runner toes can look. I’ve also been wearing Injinji trail toe socks. What I like about these is that they keep my toes separated, and it allows for a more natural splay in my shoes. Am I saying that these are the best for you? No … I think that everyone needs to find out what works best for them. But I can tell you that Altra’s are the shoes for me!! One of the greatest pieces of equipment that I bought when I had my knee surgery a couple of years ago was the ElliptiGo. I bought it because I needed to find something that would supplement my running and take a lot of the pounding from off my knees. I had been reading about it, and I saw that a few Professionals were using it to supplement their running. I figured that if it was good enough for the Pros, then it was good enough for me. When I got it, I was a little worried that I would have a hard time using it. It seemed awkward to get on and to stop. I have to admit, I still find it awkward for both. You really have to concentrate to make sure that you don’t fall over when you stop at the stop signs. Luckily for me, I only have three stop signs that I need to stop at before I one mile loop that I get to ride at Hampton Park. Anyway, today was a cross training day, so I decided to break out the ElliptiGo and give it a spin. I forgot just how hard it was, but I got in a solid 30+ minutes (I think it was just a little over 35 minutes) and was able to get in some fun cross training. It’s really neat to see the looks, and to have people ask questions since it’s not something that is seen much here in Charleston. My food intake is going well. I had a treat last night in the form of Chocolate Cherry Chia Pudding. I used everything but the sweetener, and I did not use that much cacao powder (I used one table spoon). It was really good, and it was a great treat after a crazy day. So far my comeback into running has been ok. I’m not going to say that it’s great, but I’m also not going to say that it’s good. I have noticed that once I run, I have been hungry!! Not just hungry, but really hungry!! To the point in which I can’t seem to eat enough food. My go to has been trail mix … Not the best thing to eat, but better than some things. But this week, I’m going to try something a little different. I also said that I wanted to switch my rest days to Sunday. That way I get to spend some more time with the family on Sundays and I’m not always out training. I think that’s why I like running, although I incorporate other exercises into my routine. Running gives me that flexibility … for the most part. With Triathlon training I just didn’t seem to have that much flexibility unless I wanted to use all of my vacation time. Anyway, my Saturday run consisted of a 15 minute walk, then I did 16 reps with 1 minute run and 1 minute walk. I did a cool down walk back home. Not big distance total, but it was 3.79 miles. Sunday was an off day. Again, I did that so that I could switch my off day to have my time with my family. And today I did a 15 minute walk, then I did 24 reps with 1 minute run and 1 minute walk. I did a cool down walk back home. My total distance was 4.79 miles. Not a lot, but a good total considering that I’m planning on doing the Space Coast Half Marathon the last week in November. So I’m pretty happy … Remember, I just want to finish. I don’t care about my time and I don’t care if I have to walk. As far as my diet, I’m really going to buckle down for the next month. I’m not going to starve myself, but I’m going to really focus on what I eat and really try to only eat those things that are good for me. I will eat my fruits, veggies and meats. I will stay away from anything that has added sugar. I will eat some rice, but only as a treat and when I go eat Sushi! But that’s later this month. So for right now … It;s good, whole, clean food. I can say this much, it’s not going to be easy. A 5 month lay off is hard to come back from. I know that I will get there, but I have to have patience and not push the limits while I continue through the recovery process. It’s also hard not to get disappointed. I can’t run 2 miles steady, but I was able to run 30+ miles with no problems before. It really takes a tole mentally. Again, I can’t compare what I can do now with what I used to do. It was the same when I was coming back from my knee surgery. All of the PRs that I set prior to the knee surgery are not within my reach now. My body can’t do what it used to do. I just have to keep that in mind, build back up my fitness and soon I will be back at the higher mileage. Anyway, on Thursday I warmed up for 15 minutes with a brisk walk. I then did 16 reps with 1 minute run and 1 minute walk. I did a cool down of a 15 minute walk back to the house. I felt better than I did the other day. I just know that it will be a little while. Today (Friday) I just went for a walk. Nothing major. It was just an easy stroll for about 50 minutes. It was perfect because it was just what I needed since I was frustrated with work and I needed to get some fresh air. Sometimes a walk is just what you need. My diet has been mainly meats and veggies. I’ve had a couple of eggs, some steak, backed cauliflower, roasted broccoli, squash casserole, and tomato pie (without the crust). I’ve snaked on homemade trail mix. But I know that I need to knock that one off. It’s just that it’s a good comfort food and something that is easy to snack on. But I think that this week will be my last week, and I will stock up on some fruit for next week. I’m just going to keep trucking along, and do another run/walk session tomorrow, then a walk on Sunday. I may shift my schedule so that I have Sunday as a rest day. I like the idea of being able to have a rest day over the weekend so that I can get in more family time. I’m so ready for the weekend? How about you? One of the things that I have learned is the importance of cross training. As I get older (I’m now 51), my body can’t take the every day pounding that it used to. I know that if I continue to pound it and pound it that I will end up with another injury. So I know that I need to cross train. There are a lot of things that I like to do to cross train. I like yoga, using the TRX (for strength training), cycling, the ElliptiGo and my newest obsession … mountain biking. I’ve never been mountain biking before, but since it’s something that I can do on the trails that I run on, why not! 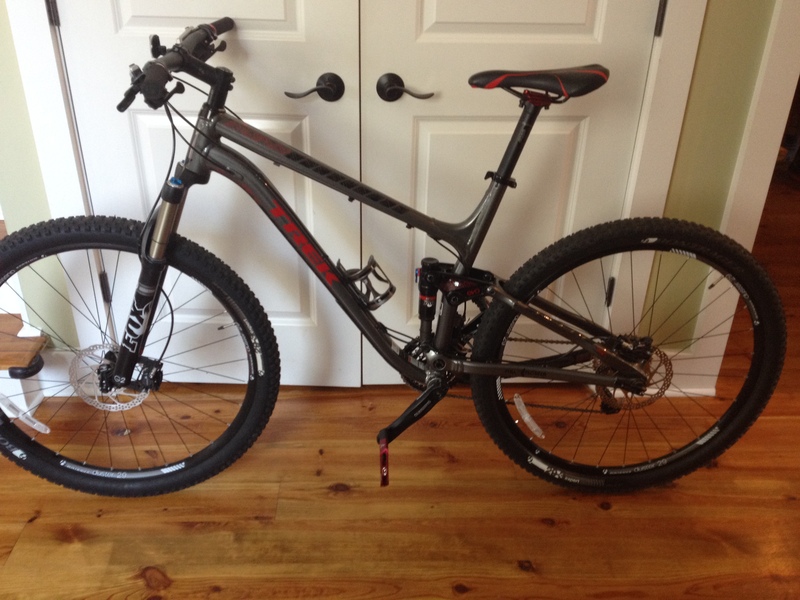 So I went and bought me a 2014 Trek Fuel EX 8 29. Granted, I have not been out on the trails yet (6 more weeks before that happens), but I have ridden it on oyster shell paths, on grass, etc and I’m in love. It feels really good, and it ride so smooth. I know … Pretty sweet!! Anyway, like I said I know that I need to cross train, so today was 30 minutes on the mountain bike riding the oyster shell path and also through some grassy areas. Total time was 45 minutes, but there was a warm up and a cool down before the actual workout began. It felt pretty darn good to be out there, and since it was pretty hot (91 degrees), I knew that I’d get a good little workout in. Today for food is a little different than normal. I had three eggs and country ham for breakfast. Not sure what I will have for lunch yet, but I know that I will have rib eye steak, just like loaded baked potato (cauliflower), and bacon broccoli. I’m not real hungry for lunch, so I may just have some fruit or something to eat. If I’m not hungry, I’m not going to push it. As far as being an older athlete, one of the best blog posts that I ever read was one by Joe Friel. He wrote a whole series on aging that you can find starting in June 2013 on his blog (www.joefrielsblog.com). It was by far one of the best series that I have ever read on aging and the older athlete. Needless to say, I will be putting a lot of this into use as I begin to ramp up my training to conquer my first 100 mile trail race. I hope you are enjoying and I will write more tomorrow. I knew that it was going to be hard. I’ve only been able to walk for the past three weeks, and it’s been 5 months since I tore the tendon. But I didn’t know that it was going to be this rough!! UGH!! It probably also doesn’t help that the temperature is in the lower 90’s and the humidity is pretty high. I was SOAKED!! I will say that I did it, and that’s what counts. Since I know that this is going to be tough, I’m doing a walk/run for the first few weeks. I’m trying to keep my heart rate low, and I realize that I need to rebuild my base. I know that I have no base fitness, so I need to start from scratch. First, I’m a huge believer in a fasted run if it’s nothing to intense and to long. Since I knew that I was only going to run 2 miles with a walk/run and a warm-up and cool down that consisted of a walk, I know that I don’t need to fuel for that. I have plenty of fuel to support this effort. My run consisted of a 15 minute walk. I gradually increased my pace while walking so that when the 15 minutes were up, I was able to go into a slow jog. I did not attempt to run fast since I know that I need to work on my base which is my zone 2. I decided to do the next 2 miles using the Galloway method. So what I did was jog for 1 minute, then walk for 1 minute. I ended up doing over 2 miles, since I did the 1/1 for 16 reps. Once the 16 reps ended, I walked back home for 15 minutes. My total time was 1:02, and my total distance was 3.82 miles with a 16:15 average pace. It’s going to be a long road back. I wasn’t hungry when I got home, so I felt that there was no need to eat. I eat a “real” food diet which means that I don’t eat anything that comes in a box. In a nutshell, I eat foods that are minimally processed. For example, I eat beef, pork, chicken, seafood, eggs, all veggies (I do limit potatoes), all veggies (again, I do limit tropical fruits since they are pretty high in sugar), and full fat dairy. I had my favorite thing which is breakfast for lunch (or for dinner). I had a veggie omelet (3 eggs, spinach, onions, mushrooms, tomato, and green pepper) and a pan cooked ham slice. It hits the spot!! For dinner, I plan on having roasted chicken (rosemary and lemon), along with a crust-less tomato pie. I do like a snack at night, and it is usually seasonal fruit or nuts, or both. And for those times when I want a real treat I will make my own “ice cream” which is just heavy cream and frozen berries blended in my Vitamix. I’m going to continue to drink plenty of water today, and then get ready for my next day. I’m sure that I will be able to do the Space Coast Half Marathon, but it’s going to be tough. But I have this … Determination!! I know that I’ve been absent from my blogging for a while. And for that I apologize. But it has been an interesting few months. So of you may know, others may not, but I was training to run my first 100 mile ultra earlier this year (April 5th to be exact). I was really excited, and training was going pretty well. I had the usual aches and pains that go along with training to run that distance. Then on the 4th of March I was out for an easy run. The top of my foot was sore, so I really worked on stretching it and not pushing it to hard. I did some sprints in the grass, and was walking home. I was about 2 blocks from my house, when I saw that the street sweepers were coming down my road. The last thing I wanted was a ticket, so I started to run home, and then POP!! I didn’t know what happened, but I limped home and managed to move the cars. I went in the house and took off my socks and shoes only to notice that my big toe was floppy. At that point I knew something was wrong. Well, to make a long story short, I got a MRI, and my Dr told me that I had tore the extensor hallucis longus and that I needed surgery. Needless to say, my quest for the 100 mile run ended. The following week I was in for surgery! 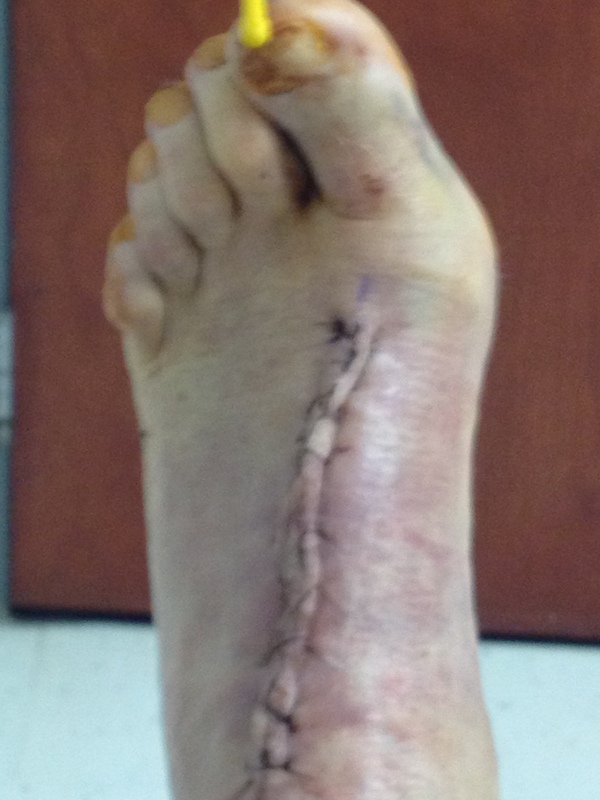 Well, this is what my foot looked like 3 weeks after surgery. I know … Not a pretty sight. But the worse part is, no running, no nothing for 16 weeks!! So what did I decide to do? I decided to go ahead and get my shoulder fixed as well. So yes, as soon as I was in the boot, which was 7 weeks after surgery, I went in for shoulder surgery. Of course, it was worse than he expected, so the surgery took a little longer than expected, and it also meant that recovery would be longer. Nothing like recovering from two surgeries at the same time. So, what does that mean as far as training? Well, it meant that all training came to a dead stop. In fact, I was finally able to start walking the 18th of July! But I was still in a sling, and still no running while my shoulder was healing. Well, today is the day. It’s the 11th of August, and I’m hoping that I will be released by my Dr this afternoon to begin running. What did I do for celebration today? I took my last long walk of 3.2 miles, and I’m ready to get back into it. So what will you get from my blog? I will be documenting my training and my diet as I begin to make my come back so that I can eventually run the 100 mile race. I don’t have a time picked out yet that I will attempt the run again, but I will work on getting back my endurance and losing the weight that I gained while I was lazy for these few months. I will say that as it stands right now, I only have two races scheduled. My first race back will be the Space Coast Half Marathon on the 30th of November. My only goal is to finish the race. I have no time goal, and I will listen to my body to see how fast I will be able to run. If I have to run/walk, then that’s what I will do. The second race I have on my schedule is the Flying Pig Marathon the 3rd of May. I intend to do a full marathon on that Sunday, as well as a 5K and 10K on that Saturday before the race. Again, no time goals other than to finish the race, and begin training for an ultra at the end of the year (probably a 50K). But this is what you will get. You will get my training and my nutrition plan, along with how to do this while keeping your family happy. Anyway, I hope that you enjoy the bog and that you keep coming back.